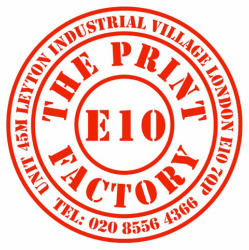 The Print Factory: Business printing, personal stationery, wedding and events - Personalised printing for business, for events, for you. Here at The Print Factory we endeavour to make your experience with us uncomplicated and stress free. We liaise with our customers either over the phone or face to face, you'll never be expected to fill in a form offering a limited choice of layout and materials or connected to an automated system where you become one of many. We know that this could be the first time you have used a print company so, we take our time to explain and guide you through the best options, tailored to suit your bespoke requirements. If you would like to look at samples or show us your existing artwork in person, give us a call to arrange to come and visit. With our in house resources, skill and expertise, we consistently maintain the high standards expected of us by our business customers, producing superior quality print from one off simple requests, to ongoing more complex orders. Your 'stationery wardrobe' can be as big or small as you wish. Furnish your stationery requirements, from personalised headed note paper through to printed envelopes, in your own unique fashion.